Watch out for boating accidents. Not all crashes take place on roads! It is March and we've noticed a lot more small boats on the intracoastal (intercoastal). One of the benefits of having one of our offices on the water in Lauderdale-By-The-Sea is watching the boats go by; from mega-yachts to very small pleasure craft. 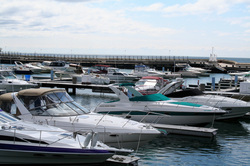 Boats also dock outside of our office on the nearby dock/seawall. Of course, we don't have the time to sit and watch! We treat our clients like guests when they come in for a meeting and they certainly enjoy the view. One of the great benefits of living or having a vacation in Florida is the opportunity to go boating and we have some of the best waters in the world. Water skiing, fishing, sailing, diving, swimming, and just enjoying the sun while on the water is great fun! Unfortunately, accidents and injuries can and do happen. Please learn the "rules of the road" on our waterways and carefully operate your boat. An accident can just as easily happen on the water as on a highway. Today, with power boats getting larger engines and more of them, speeds are increasing and the risk or serious injury increases proportionately. A typical outboard motor's horsepower just a few years ago used to be in the 30's to 70's. Mercury, Johnson, Yamaha, Honda and others are now making outboards in the 100's to 300 horsepower range. You see fishing and other boats now with multiple outboard motors. Just be careful in the operation of your vessel; whether it is a small boat or a large yacht, power or sail; and if an accident should happen you may very well be entitled to compensation for your injuries. Unfortunately, drunk "driving" or operation of a motor boat does happen in Florida and these accidents have caused fatal and other serious injuries. Someone else's negligent operation of a boat can really ruin your fun day or a fun vacation. Please have a great time boating, be careful, follow the rules of safe boating, and contact our offices should someone cause you or your loved ones any harm.